Arthur Cola lives in Burlington, WI. He is a retired educator who began writing novels upon his retirement from education 7 years ago. His interest in the arts has been a life-long one though not fully realized until his writing career began. He adapted plays for performance in his schools and created the Bicentennial Award winning production of an original work: “What is America?” His first published work was that of a children’s book, which was created for his grandchildren. Papa and the Gingerbread Man led him to delve into writing novels based on history and legends for adults. As a former history teacher he loved the cultures, folklore and events of diverse periods of western history. Adding his love for his ancestral roots in Italy there was born his Legendary Tales. And yet his first books were based on Celtic legends and Faith Traditons of Ireland in honor of his Irish wife. Papa and the Leprechaun King takes the reader on a quest with Wisconsin tourists who end up saving the Kingdom of the Wee Folk while on tour of Ireland and The Shamrock Crown takes a Wisconsin family to Ireland and Britain where they must find and preserve the most precious relics of Ancient Camelot before sinister forces do. In the process they bring the Knights of the Round Table into the 21st Century. His next two novels swing from Britain to Italy and include his Chicago roots as well. The Stone Cutter Genius is a tale of a teacher and his two teen sons. The teacher is conducting classes on the life and times of the famous Renaissance artist Michelangelo when he is informed of an ancient legend of the Magi Ring. He and his sons embark on a quest to Italy where they must find the legendary ring said to possess supernatural powers so that its power would not be used by a cult bent on possessing the very souls of young people. The sequel to that novel is The Brooch. It is really a love story of sorts in that a mystery must be solved involving Michelangelo’s love for a woman named Vittoria Colonna and his life-long friend Francesco Granacci. The lives of six sons become intertwined as this message of love expressed in the design of the Campidoglio in Rome must be found while one of those sons seeks to revenge his father by destroying that message for all time. His newest novel will be released in time for the Christmas Holiday season and appropriately so in that it leaps from Renaissance history and legends to tackle a David and Goliath story mixed with a 21st Century Romeo and Juliet sub-plot. And all of this takes place in Chicago’s “Little Italy” area. A Pastor struggles with the losing battle with a large land development corporation which controls the land lease for his Church. Our Lady of Pompeii Church and school is set to be closed and destroyed the day after Christmas. A third grade boy overhears the decision and takes matters into his own hands. His older sister and a boy from the local Catholic High School meet secretly in the Church garden as their parents are not accepting of their different heritages. The boy, John Nannini, being Italian-American and the girl, Elena Gonzalez, being of Mexican-American ethnicity try to overcome those obstacles. Add to this mix a white bearded stranger who confronts the little brother, Romero, as he enacts his dastardly deed and you have a Visit from St. Nicholas in a 21st Century adventure which defines the true meaning of Christmas in the hearts and souls of all people. Creating these stories for Arthur Cola is like bringing history alive and messages of such contemporary headlines as immigration, sexual orientation, faith traditions, cultural heritage and family values are woven into those stories. History and its legends are what motivate Arthur in the creation of his tales. In fact it might even be said that rocks are the source of his inspiration. It was his passion to collect rocks from wherever he visited and create stories about them which led to the creation of his first adult novel. Writing was in his blood so to speak so it was that medium which attracted him. His writing of school plays, articles for professional publications and liturgical celebrations all guided him to bring those experiences into story telling. Stolen Christmas has just been completed and will be premiered in July. Not to let grass grow under his feet, Arthur Cola has been working on adapting the book into a screenplay and is currently working with a New York City composer in adapting the lyrics within the book, which speak of a song the character John Nannini creates, into an actual musical piece for Christmas time. His advice to young artisans is not to wait and follow their dreams as they develop their love of the arts. He says this as a husband of over four decades with five children and being a grandfather of four. “Stolen Christmas” the novel, will be the center of his exhibition this summer at Festa Italiana/Milwaukee from July 18-21, Italian Cultural Center of Chicago on May 18th, Premier of the book in “Little Italy” of Chicago at Al’s Beef on Taylor St. and Taylor St. Festa Italiana/Chicago in August. 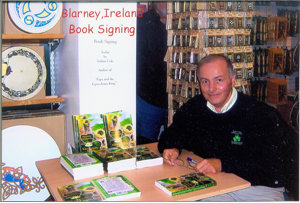 The most exciting part of writing and presenting his books is best exemplified in the wide support he has received from the businesses of “Little Italy” of Chicago such as Al’s Beef, Tuscany Restaurant, Rosebud Restaurant on Taylor St., Tufano’s Vernon Park Tap, Pompeii Pizza and Restaurant, Conte di Savoia European Imports, Mario’s Italian Lemonade, Chicago Public Library and De Pasada Mexican Restaurant. Add to this the support of the actual shrine of Our Lady of Pompeii and St. Ignatius High School, which are featured in the plot of the story, and you have the recipe for a wonderful literary experience. Fairly, there are some aspects you have to consider about health care. There are hundreds of dependable internet pharmacies that will offer legitimate discounts. For instance you can buy penicillin antibiotics that fights infection caused by bacteria. These medications will not treat some contagion for instance a common flu. Viagra is the best remedy for helping men to sustain an erection. What about viagra vs cialis vs levitra and http://isviagraoverthecounter.com/over-the-counter-diuretic.html? What do you have to know about what does generic viagra look like? Varied drugstores describe it as viagra vs cialis. A common form of sexual malfunction among men is the erectile disfunction. De facto, a medic reviews found that up to half of people on these medication practice side effects. Prescription medicaments can help us, but they can also come with potentially serious side effects. It’s significant to mind that not all drugs are really useful. Do not use any generic without telling your health care producer if you going to become pregnant soon.